It took 3 years to establish like this, the first 2 years it gave a poor show. They all look stunning. I have bought a President this year too. It's growing nicely but no buds yet. We can compare pics when they grow up a bit Jacque. My president clematis my Mum bought me for Easter, because I am diabetic and I shouldn't have Easter eggs. But it died and I was really gutted because it is really nice. Try again, dig down 2 pots deep and plant a nice shrub in front of it to keep the roots cool and damp. My Arum Lily is its companion on an east facing side. Gorgeous, I wonder what president it is named after, if any? Must have been a democrat if it was an american one as blue is their colour. 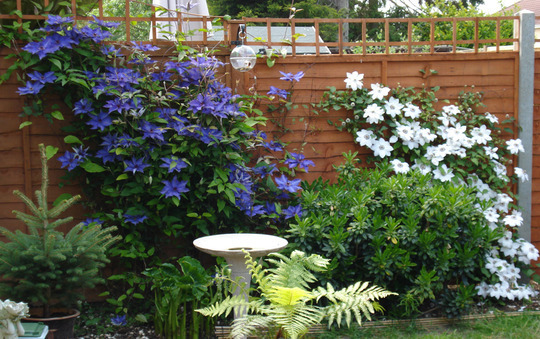 Amazing display, you must have the perfect soil for clematis vines. I agree with Gillian, lovely flowers, great photos. Wow, another plant for the wish list! What an absolutely beautiful display...wish mine would grow as big and beautiful as this! Wonderful!